Gabriel Jesus taps in at the far post. Goal for Manchester City. Kevin De Bruyne had crossed the ball in from the left; that’s an assist and a chance created. Yaya Toure had played a scything ball in to the feet of Sergio Aguero who, with his back to goal, ingeniously flicked the ball into the path of De Bruyne; that’s nothing more than a couple of completed passes. Goals and assists have long been the yardstick for a player’s attacking output, and stats like chances created and key passes are increasingly coming into the mainstream conversation when judging a player’s performance. The problem is that these ‘chances created’ are added up without any visual idea of what actually created the chance. De Bruyne gets the assist and all the value that comes with this on player rating algorithms such as WhoScored & Squawka. Even FIFA used something called the Castrol Index to rate players based on data at the 2014 World Cup, and will do so again at Russia in 2018. There’s no doubt that the Belgian deserves some credit for this goal, but the others involved might deserve something too. Aguero’s flick was vital in making sure De Bruyne had the space in which to work. It was quick, skillful, creative, and took numerous West Brom players out of the game with a single act. In ice hockey the last two players to touch the puck are credited with an assist, and it would be fair to credit Aguero with a second assist here. But then it could also be argued that Toure’s vision and willingness to risk a ball into traffic is what created the goal, and he wouldn’t even get a hockey assist. In this example more than one creator needs some credit for the goal. On the opposite end of this scale, some passes to a player who ends up scoring barely deserve recognition at all. A defender passes to an attacking player. The attacking player then takes on an entire opposition team and scores. The defender will still get an assist and this assist will be marked up in the same column as a defence splitting pass or a pinpoint cross. A midfielder lays the ball off to a team-mate, a good distance out from goal. 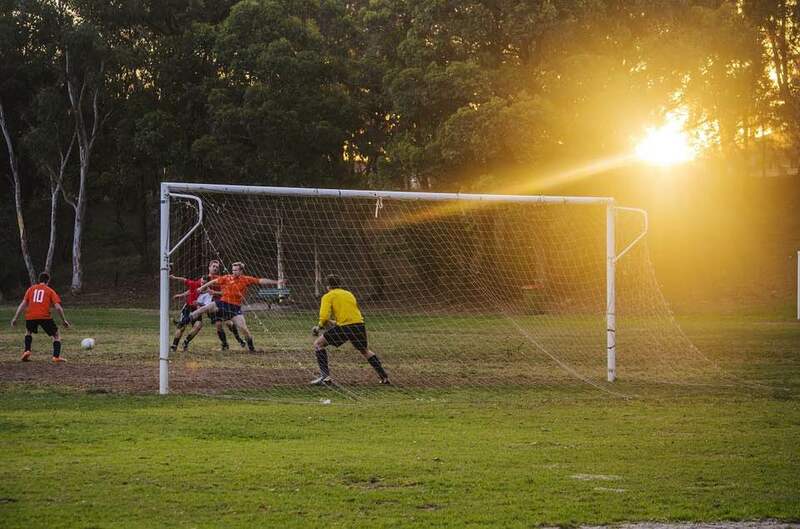 The team-mate, in a moment of inspiration, creates some space for themselves before unleashing a vicious bullet shot from 35 yards out into the top corner. The midfielder who passed it to them still gets an assist even though they didn’t do any work to create the goal. In a recent game between Liverpool and West Ham, Georginio Wijnaldum was credited with an assist after his mishit shot was diverted into the net by Divock Origi. Wijnaldum was the last person to touch the ball before Origi, but it definitely wasn’t an intentional assist. Sometimes an assist is vital to the scoring of goal to the point that it’s almost as valuable as the goal itself. But on other occasions the assist is irrelevant. Sometimes the build up to a goal is more important than the last pass. And, in addition to all this, a chance isn’t always created by the player(s) involved on the ball. Sometimes it’s created by the movement of the player who ends up scoring. Because their run was so well directed and well timed, the player passing the ball to them merely has to kick it somewhere in their vicinity. A goal can also be created by a run from a player who never actually touches the ball but drags the defence apart to create space for the eventual goalscorer. Can a player who doesn’t touch the ball be given an assist or ‘chance created’ for the goal? Not the way stats work at the moment they can’t. This is where subjective statistics, tactical considerations, and general analysis of the whole thing have to come into play alongside data. One subjective statistic would be the removal of assists which have no real influence on the goal scored, and the addition of important second (hockey) assists in the build up to a goal. Another would be some kind of acknowledgement of movement to create a goal, in the form of a chance created or assist. These are subjective statistics because they require some element of judgement on how important the various on and off ball actions which lead to a goal are. Though many statistics — big chances, for example — are already in some way subjective. No doubt this type of analysis already happens in some ways at top clubs, if not in the way described here, but from the outside there appears to be an increasing reliance on data and only data. Football statistics and data aren’t perfect, and few professionals in this field would argue at they are. But plenty of statistics presented to fans are done in very matter of fact, misleading way with no context or surrounding analysis. Winston Reid is great because he makes loads of clearances in a game. Paul Pogba is rubbish because he only made three assists last season. Ours is a sport where there are so many variables, and so many things happening or that can happen at any one time that it’s difficult to nail down key statistics in ways which some other sports have. Luckily there are now strands of analysis and data which include things which were expected to happen at certain positions on the pitch after certain player actions. Expected goals were greeted with suspicion in many parts, but are slowly being taken up as a reasonably good measure of how creative a team was in a game. 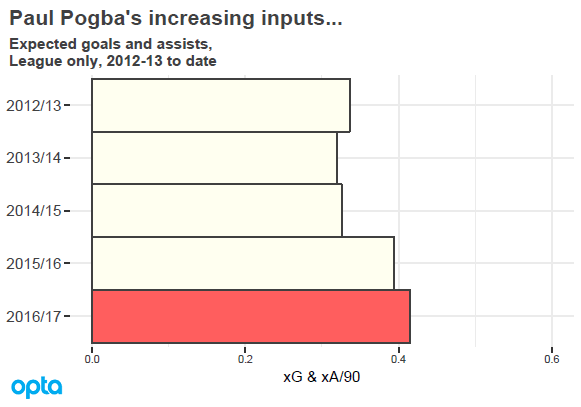 Expected assists take this even further, and a recent article by StatsBomb on Pogba showed that his expected assists and expected goals contribution has grown season on season, and 2016/17 was his most productive. It would be interesting to see his subjective statistics when it came to chances created, and it would probably match the expected assist data here. Not all goals are created equally, and trying to determine where the real value in the creation of a goal came from, if indeed there was any, will be an interesting area of football analysis to monitor in the coming seasons.